Here you can find information regarding all aspects of dogs. If you have questions regarding breeding, dog rescue, how to properly train your new pet, and several other questions you will find this section extremely helpful. The Articles contain quality information regarding such topics as health, training, care, and grooming. For instance, under dog health information you will find such topics as dog ticks, dog worming information, an introduction to Canine Health, dental care, aromatherapy and how to tell if your dog is really healthy. When searching for dog articles you want to know that you have the best information available and that it is easy to navigate. You will find this section includes all information you need to know about your dog and you will find it is exceptionally friendly for navigation. You will also find dog food and treats articles in the Article Section. Health is important for your dog, but not just the ticks and worming information. To have a healthy dog you need to know the types of nutritional content that can be found in commercial dog food as well as the types of natural health food choices you have. You will even be able to learn how to create homemade dog food. Dog articles will also help you learn about the grooming and exercise your dog may need. 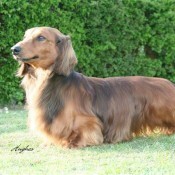 Grooming for dogs can vary depending on the breed. For instance some dogs are sensitive to being brushed on a daily basis, while others need that kind of attention. For any of your dog related needs you will find the answers in this section. You may even find information regarding topics you never thought to study. Lastly you will find general dog information for beginners. If you have never owned a dog or other type of pet you will definitely wish to check out these articles. Don't forget, if you can't immediately find what you're looking for ... Use Search at the Top Right of each Page. A Florentine pet shop saying hello and thanks for writing this.